So YAY! The fresh salsa tastes pretty good (I had half a jar extra which is sitting in my fridge) but I guess I can’t really speak to the texture of the final product, since there is even more cooking during the canning process. Cut stuff up small enough that it heats all the way through. Cover the stuff in liquid so the heat is distributed evenly. Don’t add any thickeners that will screw up the heat transfer. Cook for the full length required for the longest ingredient present. With those great caveats I’m going to offer up the recipe. I’ll report back when I’ve opened a jar and let you know how the texture turns out. I’m giving all the ingredients in their final proportions. 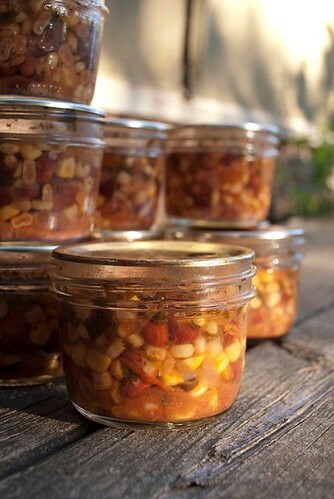 You can use either canned beans, or dried beans from the store. If you have dried beans rinse and soak them overnight first. 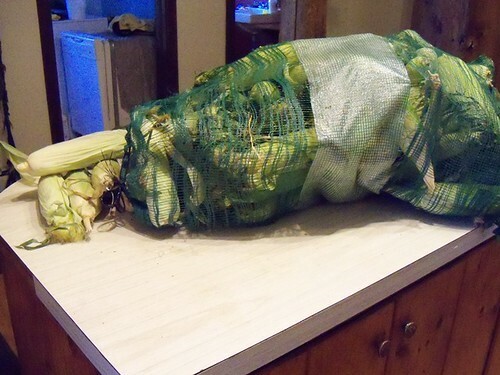 Next rinse them and cook in clean water for 45 minutes. They were on the firm side of cooked when I added them to the salsa. I have a small cutting board inside a big roasting pan. 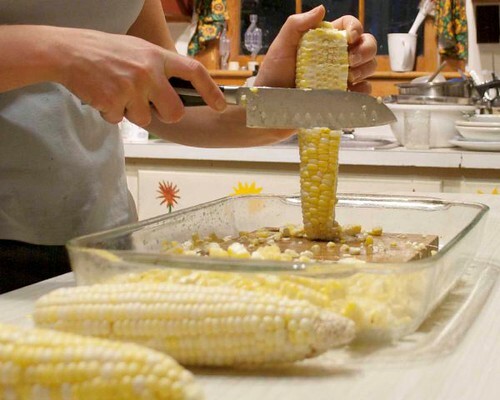 The kernels fall off the cob in sheets and tend to go EVERYWHERE. The roasting pan is big enough to catch them all. Ok, ingredient prep is the most hands-on, time-consuming part of this process. Once you’ve gotten everything chopped, diced, rinsed, and measured throw it all into a sauce pan. Bring it up to a quick simmer and adjust the seasonings to your own taste. I’m a wimp when it comes to hot peppers, you might want more. Or you might want basil if you can’t taste cilantro properly**. 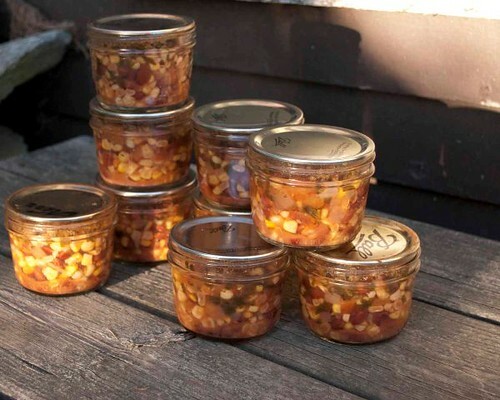 Good news with pressure canning is you can change anything you want. Heck, you could add water instead of the lemon or lime juice, but I think they add to the flavor. Spoon the salsa mix into your jars leaving 1 inch of head space. Be CERTAIN to add enough liquid to cover all the ingredients. I know fresh salsa isn’t so wet, but for home canning you need that liquid to spread the heat throughout the jar properly. Check for and get rid of any air bubbles. Place in the canner. Put the lid on so the steam can vent and bring to a hard boil. Let the steam vent for the correct amount of time (varies based on canner size) Then shut the pressure valve/put the weight on. Once the canner is up to pressure keep it there for 55 minutes. 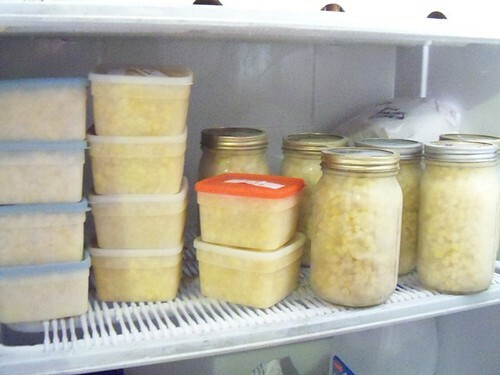 If you’re using larger jars check the time needed for sweet corn in your jar size and use that. When the time is up turn off the heat and let the pressure drop slowly. (This is the part where I went to bed) After the jars are cool check your seals and take pretty, pretty pictures of your new salsa. Or just eat it over chips. Your call. *It takes a long time for the pressure to let out. I turned that sucker off and just went to bed. **People who say cilantro tastes like soap are missing the gene that lets the rest of us enjoy it. True fact. 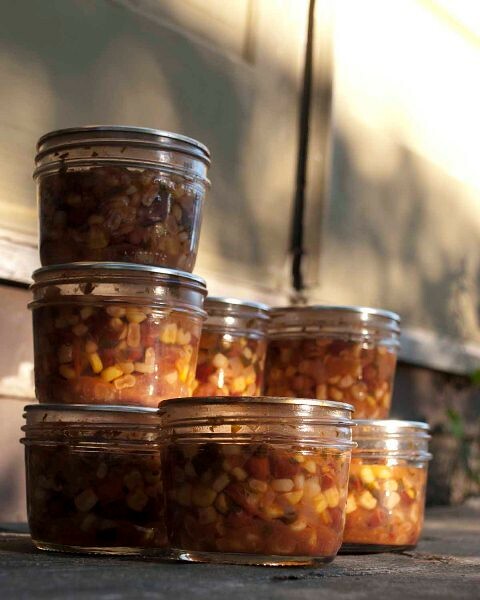 I have SIX quarts of corn which was frozen on cookie sheets and the broken up and poured into glass quart jars. 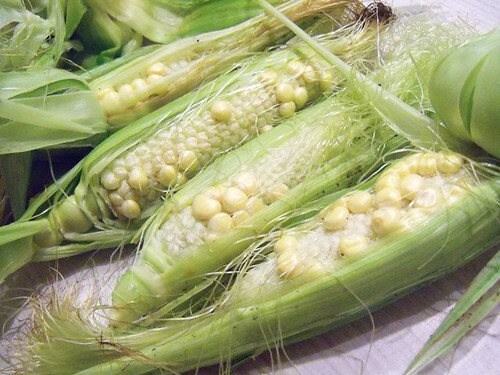 I have been either blanching and freezing or breaking up and storing corn almost every night. I have another two loaded cookie sheets that still need to be put in jars- so that’ll probably bring my total to 9 quarts of corn niblets. 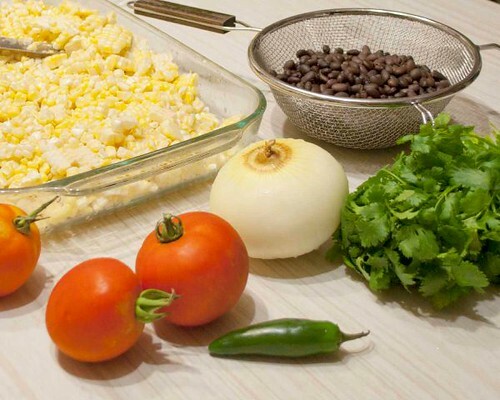 And on top of all that I just made 9 half pints (that’s a little bit more than 2 quarts in case you were wondering) of corn and black bean salsa. Hopefully. The pressure canner is cooling in my kitchen but hasn’t released yet. So hopefully it’s full of pretty jars of home canned salsa, and not a horrible mass of broken glass and veggies. What’ll it be? Find out tomorrow! I love Knitspot. 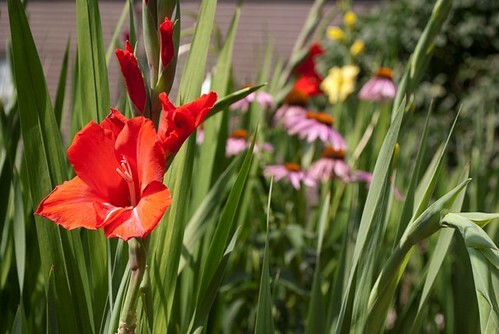 Not only is Anne an amazing designer who I look up to: she also has a garden and puts up even more produce than I do. Remember the speedy little autumn sweater I was knitting? It’s done! Yep, that was pretty speedy. It was speedy even though I ripped out the top bit SIX times. On the seventh try I finally got the right combination of raglan shaping, short rows in the back, texture and yarn in the collar, and the pleats in the shoulders. It was the sort of thing that just happens when designing. I’d swatched the texture and the pleats. 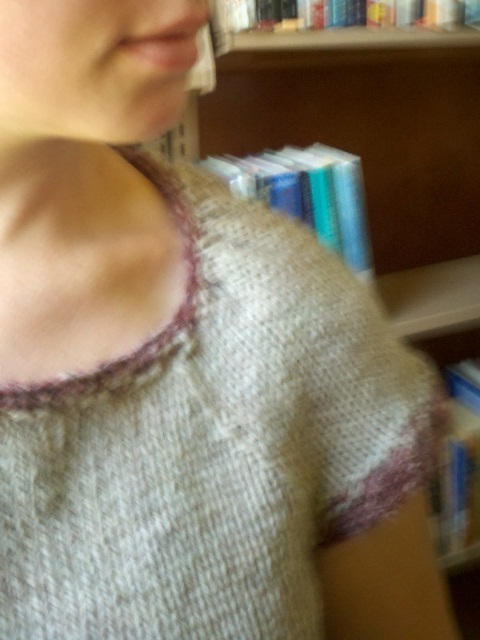 I know plenty about short rows and raglan shapes. But pulling all four features together in a way that works? That just takes frogging a few times. So the garment is done, and waiting for me to get around to blocking it. The pattern however? -could use some work. One size (mine) is figured. And it was all done by hand, in pen, using the calculator on my phone. This is not how I usually design. *If by “sneak peak” you understand I’m showing you a bunch of intentionally blurry photos. Enjoy! It belongs to my friend Calley. But she’s generously loaned it to me for the next two weeks. Right now I’m at the stage where I barely understand all the displays and I should probably just be shooting in auto mode, except the whole point here is I want to learn more details! 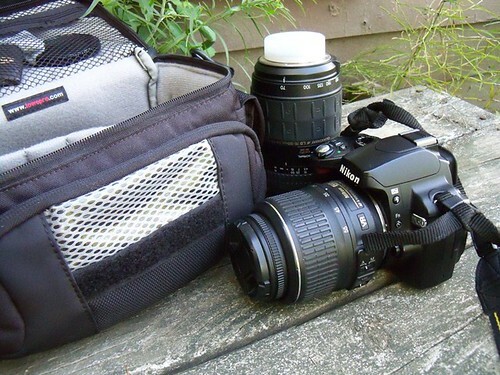 But I’m still struggling with the aperture and shutter speed settings. I mean I KNOW what those things are supposed to do. 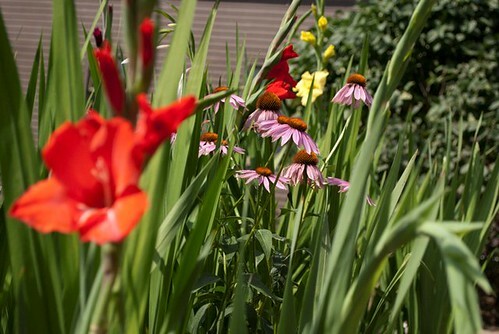 But the effects of changing the settings are much more subtle than making the same changes on my fancy point and shoot. Again that’s the whole POINT of playing with a DLSR, but still, the learning curve is steep. The first cause of discord is difference. The second cause of discord is lack of a strong leader. The third cause of discord is individual thought. 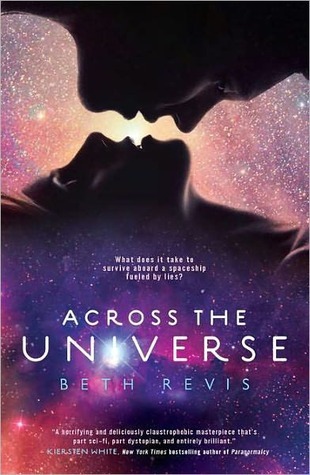 Across the Universe is the first book in this trilogy by Beth Revis. Godspeed is a ship carrying frozen passengers to a new Earth. But it is also a generation ship, with crew who will live, have families, and die within its walls. Amy was supposed to be frozen until the ship landed, but something has happened and she woke up early. But she was lucky, other frozen passenger are unplugged and left to die. Across the Universe follows Amy as she, and the future leader Elder, attempt to figure out what is going on, who is killing the frozen passengers, and how to stop them. It also explores deep ideas, what sort of society might evolve in such an inclosed biosphere. How would this society deal with an outsider? And how will Amy adjust to her new life separate from everyone she’s ever known? 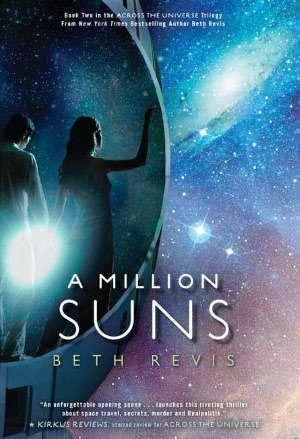 A Million Suns is the second book in the trilogy. Amy and Elder are still working together. Elder’s society is breaking out of it’s stupor, and not everyone is happy about the changes. In fact, everyone has a bone to pick with him about something. Meanwhile Amy and Elder need to figure out what is wrong with the elderly Godspeed. They need to figure it out before the people all go stir-crazy. I read Across the Universe back when it first came out. When I discovered both audio books available at my library I re-listened to the first before checking out the second. I love the way Beth Revis spins out her tale, providing enough clues to keep the reader guessing, giving us hints but never giving the full story away. I can not WAIT for the third book (Shades of Earth) to come out, but I’ll have to, because it isn’t due on shelves until January. *I’ve linked to Amazon for ease, but please check your local book store first! I was knitting with a friend awhile back when she made a comment about speedy knitting. Her theory is that everyone has a sweet spot – a spot at which they knit their fastest. The sweet spot isn’t necessarily related to the biggest gauge, or the smoothest needles. It’s a point where, for whatever reason, the yarn and needle combination make for fast knitting. Her sweet spot is US 5 or 6 needles, my sweet spot seems to be US 8 or 9’s. Worked with worsted or aran weight yarn I’m SPEEDY! I get a bit slower when handling bigger yarn and needles, same for smaller needles. But if I were to test, with the same brand needles, and the same type of yarn (merino, for instance is way faster than cotton at any gauge) and the same pattern – I’m quite sure I’m fastest with the worsted/aran/US8/US9 combo. What about you? Do you think that every knitter has a sweet spot? What’s yours? Remember back when a summer storm blew over all my corn stalks, and I had to tie them up with cotton yarn? And I was all whiny and worried about whether or not I’d get corn? Yup. My corn did NOT cross pollinate. Saturday I was volunteering at the library when I was hit with a design idea like it was a ray of light beaming down out of the sky. Saturday afternoon I may have been writing one pattern, but I kept getting side-tracked by the new a-line sweater I wanted to be knitting. Not, mind you, that I have TIME to for another SWEATER design. I’ve got designs planned as far out as December 2013! No, that’s not a typo, that’s more than a year from now. But you know what? I’m pretty much on track for all of those. In fact, I’m waiting for yarn at the moment. So would it hurt if maybe I just swatched a little? I could use something from the deep stash for a change, right? Saturday night I was swatching, and rolling skeins into balls of yarn. By 7:30 Sunday night I’d knit 13 inches of a sweater body. Yup. And it’s not like I shirked on my other duties! I went to church, walked the dogs, ran a load of laundry, swept the WHOLE upstairs of the house, AND cleaned the kitchen. I even went canoeing with Neil. That part really doesn’t count though, because by “canoeing” I mean he paddled and I knit. In fact I knit in every available moment. I knit while water boiled for dinner. I knit in the car to the lake. I knit and knit and knit. And I’m going to go knit some more right now. 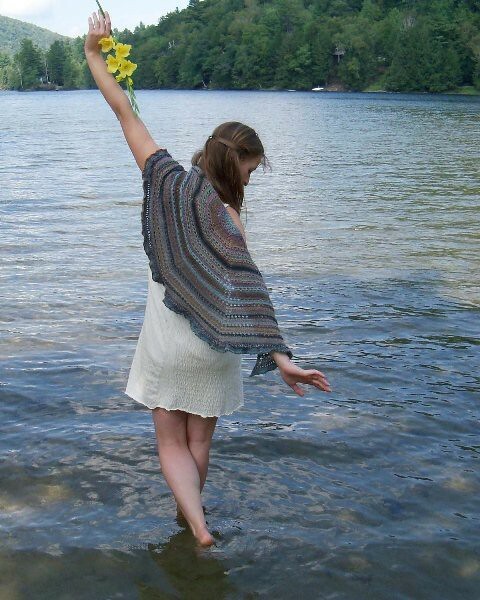 I published a new design today, my Nymphaea shawl. 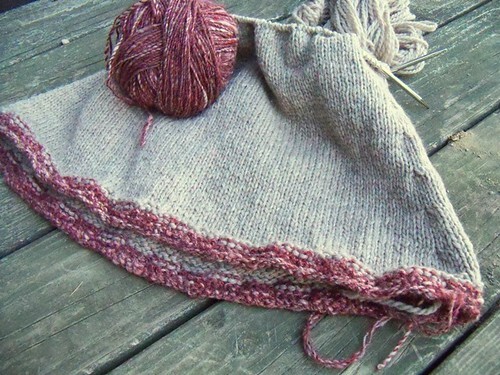 This little shawl is worked from the top down. Designed specifically for self striping yarns the pattern directs you to work an eyelet row whenever the colorway changes. Each shawl made from this pattern will be unique, and will perfectly match the colorways in the yarn! You can favorite and queue it on Ravelry here. This pattern has been waiting in the wings for a looong time. Crystal Palace sent me the Sausalito yarn back when it was first released. That was 2010. I know, I know, I said it was a long time! By then I’d moved on to other projects. 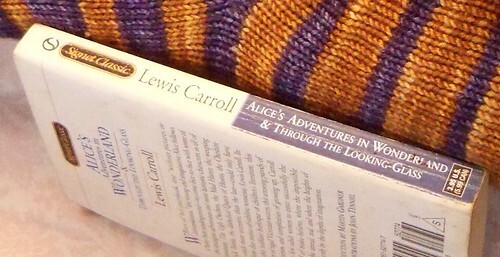 I knew I wanted to release it in summer, and last summer I was kinda busy with my e-book of fingerless mitts. So the poor little shawl just kept waiting. This summer I knew it was time! But when my editor saw the PDF she kindly informed me that my photography had improved so much I probably shouldn’t use the original photos*. I had kept the shawl over the back of my favorite chair, where I can pull it over my shoulders any time I feel a bit cold. Before I could take any new pictures I had to wash and re-block the shawl. Once it was washed I remembered how much I love this pattern! Nothing like a bath to spruce up a bit of knitting. Neil and I took it to nearby Metcalf pond and got some pretty new photos and I’m really excited to share this shawl with all of you! 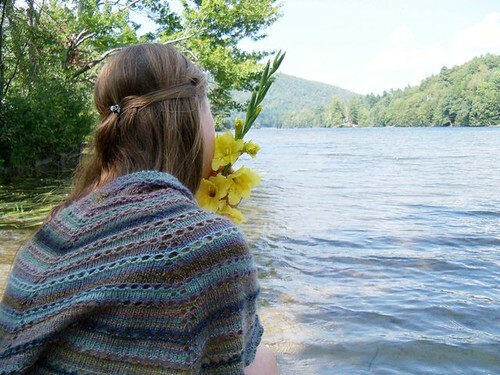 Nymphaea is a really simple shawl to knit up. I loved working on it when I needed a break from patterns that were draining my brain power. 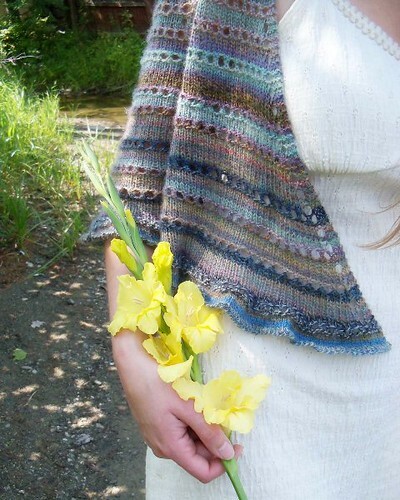 This small shawl uses 3 skeins of Sausalito, and you could knit a full sized shawl with 4 skeins. Let’s play a word association game! I’m trying to name a pattern I plan to release in September. For reasons only my subconscious could explain* this pattern is tied to the book Alice in Wonderland. So I’m looking for an Alice-in-Wonderland-y type name. Really, my biggest problem is that Cheshire is already used 22 times on Ravelry. 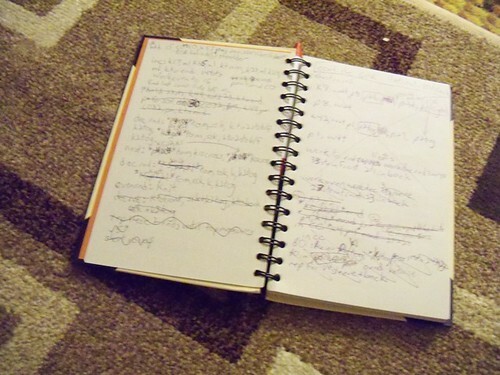 **I’m not telling you what kind of pattern on purpose, I don’t want to box in any brilliant ideas.